The fields shown within each table differ according to whether the user selects a simple nominal, locational, occupational or date-limited search, or a more detailed investigation based on the results of the first selection. The database is not case-sensitive. First name. Names with variable spellings have been transcribed as they appear on the passenger list, with the exception of abbreviations, which have been standardised in full (e.g. Alexander and Isabella, rather than Alex and Isa). In cases where married female travellers were recorded simply under their husband’s given name, that name has been entered in the Notes field, with the female traveller being entered as ‘Mrs’. For initial queries it is advisable to experiment, using initials or fuller names with varied spellings. Surname. Surnames have been transcribed as they appear on the manifests. It is advisable to search under variable spellings (e.g. ; Mcintosh, Mackintosh; Thomson, Thompson). For semi-legible surnames guidance was sought from George F. Black, Surnames of Scotland (Edinburgh, 1999). Occupation. Abbreviated occupations have been given in full (e.g. Blacksmith for B’smith). In cases where ditto marks appear on the manifest but the occupation is clearly incorrect (e.g. female blacksmith), the occupation field has been left blank, with the information originally recorded on the manifest being entered in the Notes field. House/Street. Normally the name of the house, building or street named by the passenger as their last place of residence. All street and sub-street names for addresses in Edinburgh and Glasgow have been checked in the relevant Post Office Directory for 1922-3. Some addresses (e.g. 54 St Nicholas Street, Aberdeen; 63 Main Street, Dundee) refer to the commercial premises of agents who purchased tickets on behalf of passengers, including those travelling in organised parties arranged by the Salvation Army or the YMCA. In the case of crofting settlements the name of the crofting township (and, where applicable, the croft itself) appears under House/Street. Croft and street numbers appear in the street number field, which is accessed through a second-level search, using the Passengers’ Table Results Fields. Urban District/Village. Districts within towns and cities that were included in the manifest addresses have been transcribed. In Glasgow these have been categorised by the Registration District for the street address given in the 1923 Post Office Directory for Glasgow. In cases (e.g. Ibrox) where the district was entered incorrectly according to Registration District criteria, a correction has been made in the transcription, with the original information being entered in the Notes field. The spelling of village names has been standardised using B. B. Hartop and M. Rodger, Johnston’s Gazetteer of Scotland (Edinburgh, 1958) or the University of Edinburgh’s online Gazetteer for Scotland. Gaelic place names have been standardised in English, since the majority of entries in the manifests used English spellings. Town, City or Island. Spellings conform to B. B. Hartop and M. Rodger, Johnston’s Gazetteer of Scotland (Edinburgh, 1958) or the University of Edinburgh’s online Gazetteer for Scotland. County. Counties have been transcribed using 1923 nomenclature and divisions, except for ten passengers sampled at an earlier date, eight of whom came from ‘Forfarshire’ (Angus) and two from ‘Linlithgow’ (West Lothian). The spelling of counties conforms to B. B. Hartop and M. Rodger, Johnston’s Gazetteer of Scotland (Edinburgh, 1958) or the University of Edinburgh’s online Gazetteer for Scotland. NB: unless the specific address is known, it is advisable to begin searching a general field, such as county, town, city or island. Country of Origin. Between 1890 and 1960 countries of origin of passengers embarking at British ports were recorded in six (later seven) categories: English, Scottish, Irish, Northern Irish (after 1922), Welsh, British Dominions, Foreign Countries. In cases where more specific information (such as a particular dominion or foreign country) is provided in the manifests, this has been entered into the Notes field. From Year/Month. To End/Month. These fields restrict the search to a specific time span, either by year, or by month(s) within a year. Ship. The names of all ships entered in the database can also be selected using the Ships’ Table. All ship names have been checked against the Lloyd's Register of Shipping, held at the National Maritime Museum, Greenwich. Organised Group. 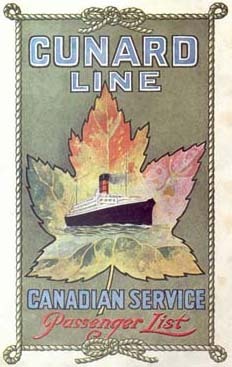 Some passengers travelled in groups under the auspices of organisations such as the Hudson’s Bay Company or the Salvation Army. The eleven organisations identified in the manifests can be selected by using a drop-down menu. Destination Port. This information has been transcribed from the last column of the passenger manifest. Although the cover sheet of the manifest may have indicated that a ship was bound for a particular port, the vessel could have called into other ports en route or subsequently. For instance, all vessels belonging to the Cunard Company and setting out from the port of Glasgow had begun their journeys at Sandon Dock in Liverpool before collecting additional passengers at the Tail of the Bank (mouth of the Clyde). Similarly, all those sailing with the Anchor Line called into Moville (near Londonderry) en route to North American destinations. Furthermore, passengers shown as being destined for New York were sometimes allowed to disembark at Boston. Destination Country. This was the country where passengers stated they intended to reside for the subsequent eighteen months or longer. The declaration was often misleading, as many passengers who claimed they were destined for Canada actually moved over to the United States, thus avoiding the restrictions on immigration into the USA resulting from the 1921 and 1924 Quota Acts. NB: variations in the information provided in the manifests over time mean that data cannot be entered consistently into every field. For instance, specific dates of birth were available only for 1960. Fields for which information is only intermittently relevant or available are indicated with an asterisk (*). Count. Unique identification number given to each record on the database. Official Number. The identification number assigned to a particular vessel on all its voyages, though foreign-registered ships rarely had such numbers. The official number permits record linkage between the Passengers’ Table and the Ships’ Table in the database. Departure Date. The official date when the vessel was due to clear the port (year-month-day, in figures). *Contract Ticket No. Number for the passenger or group of passengers travelling on a ticket. If several passengers travelled together on the same ticket, it usually demonstrated kinship connections. *Title. Not given unless specified on the manifest. (Mr, Mrs, Miss, Master, Dr, Rev, Major, Prof). Passenger Surname. Transcribed exactly from manifest. Passenger Name(s). Given name(s) or initials. Names are spelled in full. *Date of Birth. Year-month-day, in figures. *Organised Group. E.g., Hudson’s Bay Company, Salvation Army, YMCA. *Travel Agent. Name of person who purchased the ticket on behalf of the passenger. Their status was normally indicated on the manifest by the prefix ‘c/o’ before the passenger’s address. The category included both commercial agents and relatives of passengers. *Marital Status. Not yet entered. *Name of Building. Name of house, hotel, office premises etc. *Sub-Street Number. Entered if appropriate. *Sub-Street Name. Entered if appropriate. *House Number. Entered if appropriate. *Street Name. Street or croft/crofting township. *Urban District or Village. All Hebridean entries record the crofting township where the passenger last resided. In the case of passengers from an area within the city of Glasgow the urban district shown is the official registration district in which the property was situated at the time of sailing and not necessarily the way in which the passenger would have noted the address. Town, City or Island. Major towns, the four cities of Edinburgh, Glasgow, Dundee and Aberdeen, and the islands of Shetland, Lewis, Harris, North Uist, Benbecula, South Uist, Skye, Bute and Arran. *County. Recorded by their 1923 nomenclature, except for passengers sampled at an earlier date. Type of Passenger. Between 1890 and 1905 all passengers were classified as either British or Foreign. After 1906 all passengers were shown as ‘British’, ‘Alien Transmigrant’ or ‘Alien Non-transmigrant’. Class of Passage. Third, Second Cabin, Cabin, Steerage, First, Tourist. Occupation. Transcribed from the manifest, except where there are obvious errors. In such cases, the field has been left blank, with the information from the manifest being entered into the Notes field. Age Category. Assigned by pursers of shipping companies when completing the manifests. They used a standard eight-category template (male with wife; female with husband; male over 12; female over 12; male child over 1, female child over 1, male infant, female infant). Entries could be misleading. E.g. any woman who was travelling alone would be classified as ‘female over 12’, and any man travelling alone as ‘male over 12’, with the implication that such passengers were single. Age. Transcribed from the manifest. For those aged under 12 months old decimal points have been used accordingly: Infants aged 1 month old would be shown as 1.01, those aged 10 months 1.1, etc.. Ages, particularly of older female passengers, were often not recorded. Country of Birth. Transcribed from the manifest. Origin Country. Transcribed from the manifest. Destination Country. Transcribed from the manifest. Image Number. The number of the digital image from which the information was transcribed. Journey Cancelled. If a passenger was crossed off the manifest this has been recorded as a cancelled journey. The manifests do not indicate the reasons for cancellations. Country of Which Subject. The nationality shown on a passenger’s passport. Port of Arrival in UK. The port at which foreign passengers had disembarked on arrival in the UK. Such information was only supplied (after 1906) for transmigrant passengers, or those who arrived and re-embarked from Britain within fourteen days. Steamship Line to UK. The shipping companies that conveyed foreign passengers to the UK. Such information was only supplied (after 1906) for transmigrant passengers, or those who arrived and re-embarked from Britain within fourteen days. Destination Address. Only recorded for passengers who left during November and December 1960. Destination Town. Only recorded for passengers who left during November and December 1960. Notes. A miscellaneous field, which highlights unorthodox, non-standard or erroneous entries, identifies sources or additional information, and indicates any disparities between the original record and the transcription. Ship’s Name. Name transferred from the passenger manifest, and checked against Lloyd's Register of Shipping, held at the National Maritime Museum, Greenwich. Official Number. The identification number assigned to a particular vessel on all its voyages. Since foreign-registered ships rarely had such numbers, artificial numbers have been created. The official number permits record linkage between the Passengers’ Table and the Ships’ Table in the database. Steamship Line. Transcribed from passenger manifest. Name of the company which provided the service, according to Lloyd’s Register of Shipping. The pre-printed forms were often out of date. For instance, Donaldson Brothers of Glasgow owned vessels in their own right and managed four vessels for the Anchor Line from 1916, before buying out the dissolved Anchor Line in 1935 to form the Donaldson Atlantic Line. For more information on the shipping fleets, see The Ships List. Master’s Name. Transcribed (in its fullest form) from the passenger manifest. Registered Tonnage. The gross registered tonnage of the vessel according to the Ship’s Manifest. Where this information was not provided the figure has been gleaned from Lloyd's Register of Shipping. Passenger Footage. Amount of space for all passengers (not including staff quarters) when recorded on the Passenger Manifest. This figure was based on the Passenger Certificate issued by the Board of Trade and allocated each passenger a specified amount of space. Number of Statute Adults. Number of adults conveyed. Every passenger aged over twelve was classed as one statute adult; those aged from 1-12 were classed as half a statute adult and infants were not counted. For example, a ship carrying 260 adults, 80 children and 6 infants would have returned 300 Statute Adults. Provisions for Adults. Legal declaration by the master of the vessel, required under British maritime law, stating that he had adequate provisions (food and refreshments) for all passengers. Provision Days. Number of days, set by British maritime law, for which the provisions carried on the ship could feed the passengers. Departure Date. Official date when the vessel was due to clear port. (Year-month-day in figures). Date Signed. Date on which the ship’s master signed the manifest before officials from the Board of Trade at the port of embarkation. Dock. Dock where the vessel was provisioned. If the ship was berthed in a Clydeside dock, the passengers would have embarked from there, but if it had originally been docked (and provisioned) in Liverpool, the passengers would have been ferried by tender between Glasgow or Greenock and the Tail of the Bank (the Clyde estuary). This information was gleaned from HM Customs Bills of Entry held at the Merseyside Maritime Museum, Liverpool. Port of Embarkation. Final port from where passengers embarked for ports outside Europe and the Mediterranean. Note that several passengers who sailed from Aberdeen in the 1950s had originally embarked at Hull, and had addresses in that town, but since the Aberdeen-Hull leg of their journey was classed as a domestic trip, they were only recorded as leaving Britain on outward-bound passenger manifests once they had set sail for a non-European/non-Mediterranean ports. This did not apply to those who embarked upon ships that called into an Irish port. TNA Reference Number. Archival reference code for the original manifests at The National Archives at Kew, London. Notes. A miscellaneous field, which highlights unorthodox, non-standard or erroneous entries, includes sources or additional information and indicates any disparities between the original record and the transcription. Original Port of Departure. Port from which the ship had originally left. Normally applicable only to vessels sailing from Greenock that had left from Liverpool and called in Greenock. NB: Images are currently available only for certain vessels. It is hoped to increase the number of ship photographs as the project develops. To demonstrate how the database can be used to access information on individuals who emigrated from Scotland between the world wars (1918-39), try searching for Mary Watson, from Aberdeen, who emigrated in 1923. Click on entry ‘11553’ (under Index) to learn more about Mary Watson from Aberdeen. This will produce the following tabulated information. Mary Watson’s details demonstrate the transatlantic travelling arrangements of a single female in the 1920s. Not only did she travel unaccompanied; unlike most of her pre-war counterparts, she could also afford to take a passage in the second cabin. A search on the occupation ‘domestic’ reveals that during the first four months of 1923 876 other domestics also emigrated via Scottish ports. Like Mary Watson, 304 women were bound for the United States, whereas 572 gave Canada as their destination. In terms of place of origin, Mary Watson was one of 896 emigrants from the city of Aberdeen during the first four months of 1923, of whom 453 went to the USA and 440 to Canada. The emigration process can be investigated further by examining corresponding documents generated by the US Federal Government for the same period. Using the Ellis Island Database, it is possible to pinpoint Mary Watson’s arrival at the port of New York. Although she was one of 251 females of that name who arrived at the port of New York between 1892 and 1924, the search can be refined by incorporating her age, place of origin and date of arrival. 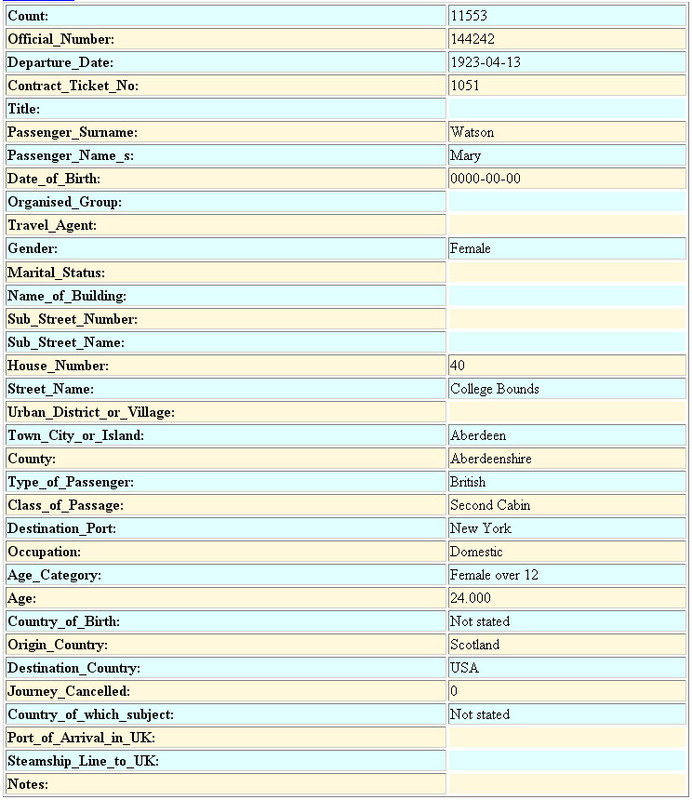 The initial Passenger Record reveals similar information to that obtained from the British records, but as the US Federal Government’s Labour Department sought more detailed information on those immigrating into their country, it can be established (through clicking onto the Original Ship Manifest option) that Mary did not arrive via the port of New York, as suggested by the entry in the Scottish Emigration Database, but via the neighbouring port of Boston. The US record reveals further biographical details about Mary Watson, who intended to join her sister, Miss Minnie Watson, in Manhattan Avenue, New York. Mary had paid her own passage, was able to read and write in English, and was not a polygamist or insane. She was 5ft 4in tall, with brown hair, grey eyes and a fair complexion and was in good health. She was a native of Aberdeen whose previous address was not her place of employment but the family home where her mother, Mrs Bella Watson, lived. Mary, who regarded herself as both British and ‘Scotch’, had not been to the United States before.